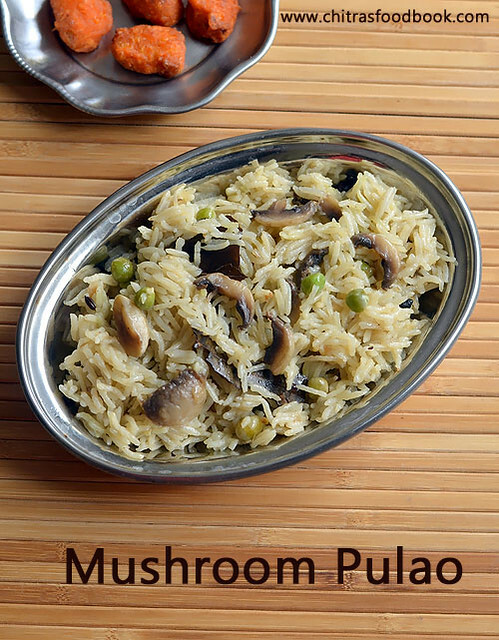 Last Sunday I prepared this Indian style mushroom peas pulao with some leftover mushrooms and fresh green peas in a pressure cooker. 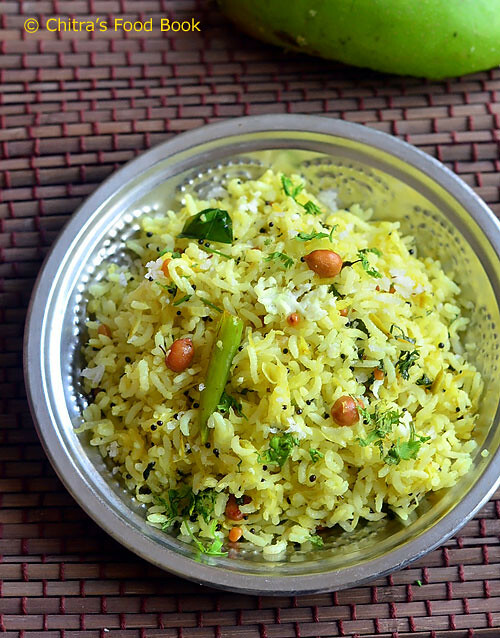 Its a very simple and easy pulao recipe just like my vegetable pulao. It can be prepared directly in an Indian pressure cooker. So it gets ready under 15 minutes. No grinding or big chopping works needed. You can prepare it for your lunch box easily and quickly. 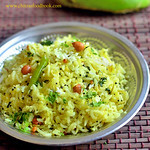 Since its a mild pulao recipe without much of garam masala powders, you can enjoy it with any spicy kurma as side dish. But my family liked it with simple onion raita. Usually people add coconut milk instead of water. But I used only water to cook the rice. Still it was good with nice flavor. 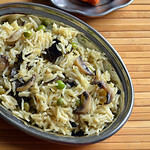 Lets see how to make this simple and quick mushroom peas pulao with step by step pictures. Check out my crispy mushroom 65, how to choose n buy, clean mushroom, Thalapakkatti biryani with mushroom, Thala ajith style biryani with mushroom and easy mushroom biryani in pressure cooker. Wash and clean mushroom. Slice it and set aside. Heat oil + ghee in a cooker. Saute whole garam masala. Add onion, gg paste, green chilli, mint leaves and saute till transparent. Add mushroom, peas and saute for a minute. Add rice, saute for a minute. Lastly add water or coconut milk and mix well. Pressure cook in low flame for one whistle. Wash and clean mushroom with a cloth. Remove the stem and slice it. Keep aside.Finely chop onion and slit the green chilli. Wash the basmati rice and set aside. No need to soak it. Heat oil + ghee in a pressure cooker base. Saute cinnamon, cloves, bay leaf, cardamom and black stone flower. Add fennel seeds, big onion, gg paste and green chillies. Saute in medium flame till onion turns transparent. Add mint leaves, mushroom and peas. Mix well. Lastly add the washed rice and saute for a minute. Then add 1.75 cups of water or thin coconut milk. Sprinkle few drops of lemon juice. Mix well and pressure cook in very low flame for one whistle. Remove the lid after the steam is released. Mix gently, fluff the rice and serve hot with any spicy kurma or raita ! Adjust the quantity of green chilli as per your taste. You can use thin coconut milk instead of water. I used lemon juice. You can saute one finely chopped tomato along with onion. 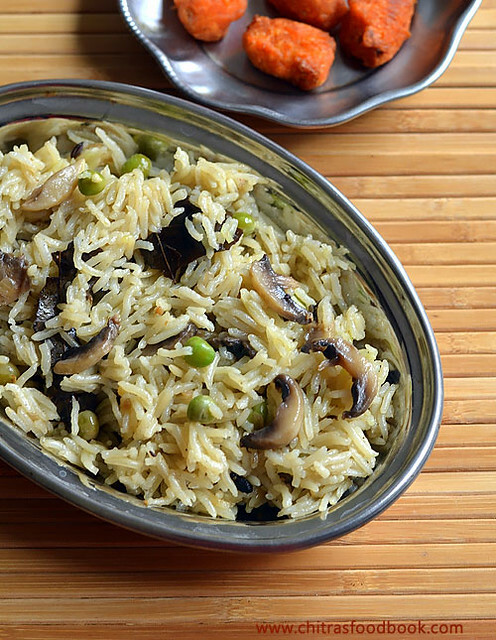 Try this easy, yummy, healthy mushroom pulao and enjoy ! I served with raita and Paneer 65. Tomato rava upma recipe / Rava upma with tomato with step by step pictures - Tomato rava upma is an yummy, instant, South Indian breakfast recipe with a nice variation from our regular rava upma. Usually I add tomato and vegetables only for rava kichadi but this morning I prepared rava upma with tomato just for a change. Basically I am a big fan of tomato based recipes. Even though I don’t like rava upma, I loved this tomato rava upma a lot. It tastes tangy and spicy as well just like rava kichadi. If you wish you can add green peas in this upma to make it look colorful. I had some leftover upma for my dinner too. It was good and stayed soft. So you can pack it for lunch box as well. 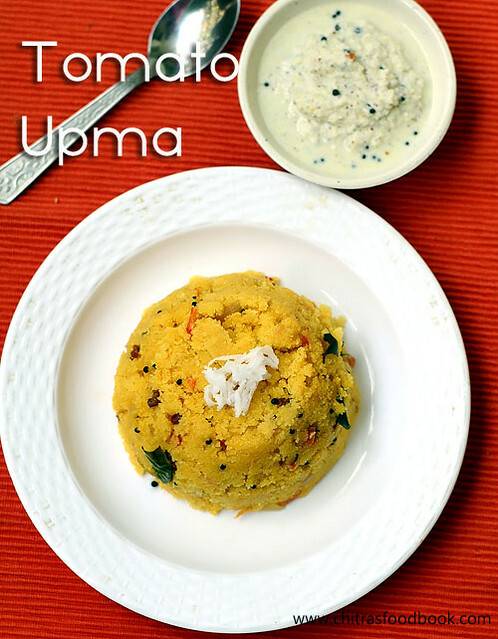 Friends, If you are bored of making rava upma, do try this tomato upma for your breakfast or dinner. 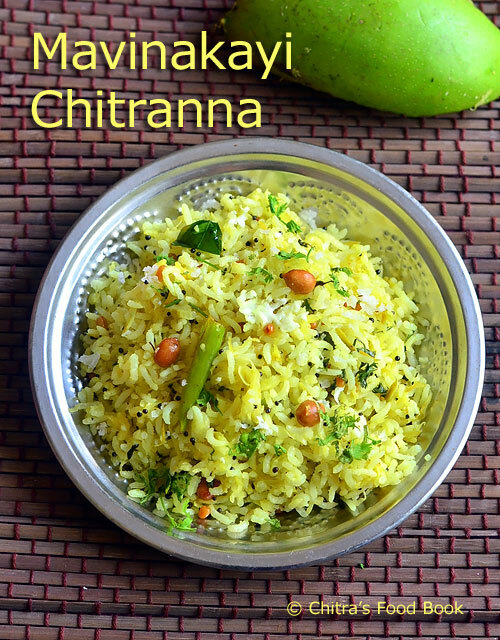 It tastes good with coconut chutney as side dish. Try and let me know your feedback . My School moms friends make Karnataka style tomato rava bath. I will ask them and share that recipe later. 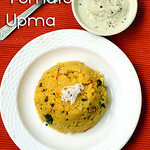 Now lets see how to make this Tamil nadu style tomato upma recipe with step by step photos. 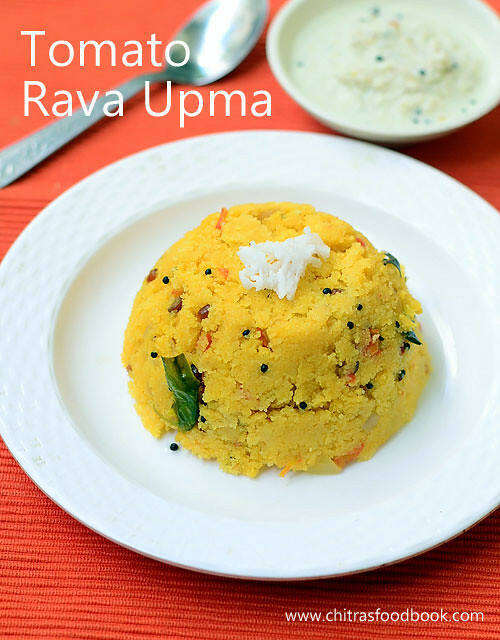 Do check out my Basic Rava Upma, Rava kichadi, Masala Rava Kichadi, rava upma mix, rava pongal, Karnataka Khara bath recipes too ! Wash and chop tomato, onion into small pieces. Roast rava till nice aroma arises. Heat oil, Temper mustard, dals.Saute the vegetables adding salt. After tomato becomes mushy, add spice powders. Mix well and add water. After water comes to boil, add rava. Mix well, cover cook for 5 minutes. Add coconut oil / ghee.Garnish with coriander leaves and serve with coconut chutney. Wash and chop the tomato, onion, chilli.Set aside.Dry roast rava for 7 minutes in medium flame without burning it.Keep in a plate. Heat oil in a kadai.Splutter mustard seeds, urad dal, chana dal and curry leaves. After it turns golden, add finely chopped onion and slit green chilli. After onion becomes transparent, add finely chopped tomato.Saute till tomato becomes mushy. Add salt to cook tomato quickly. Add red chilli powder or sambar powder and turmeric powder. Mix well till raw smell goes off.Add water and let it roll boil. Lower the flame completely.Add the roasted rava in a sprinkled way using one hand while stirring constantly with other hand. It helps to avoid lumps.Once all the rava is added, it absorbs the water and becomes thick. Cover it with a lid and cook for 5 minutes in low flame.Mix once in the middle. Switch off the flame after rava is cooked soft. Add coconut oil or ghee. Garnish with coriander leaves.Mix well and serve hot with coconut chutney! Adjust the quantity of chillies as per your taste. For variations, you can add 1/2 tsp garam masala powder for masala flavor. Remember to add rava in a sprinkled way to avoid lumps. No need to add more water. Adding more water makes it like kichadi. You can use wheat rava instead of semolina and make the same. But add 3 cups of water. Color of this upma varies as per the chilli powder you use. Use Kashmiri chilli powder for bright red color. 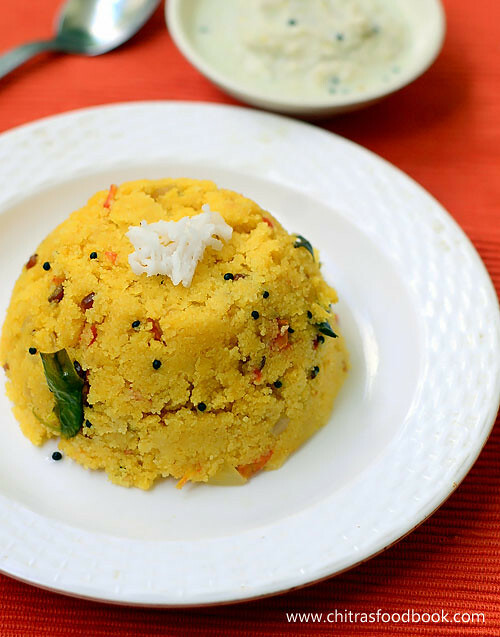 Tomato rava upma tastes the best with coconut chutney. Do give a try ! Potato poori / aloo puri in Hindi is an interesting kids friendly puri recipe.Poori would be our Sunday breakfast mostly. So I started exploring varieties of poori for a change. I have already shared Palak Poori, Masala poori, Beetroot poori, Tomato poori, chola poori recipes. This Sunday I tried potato poori ( Alu ki puri in Hindi) for the first time. I made the poori dough by mixing wheat flour with boiled, mashed potato and spice powders. Puri came out super soft with awesome masala flavor. It stays soft for hours together.So it can be packed for lunch box and ideal for travel as well. 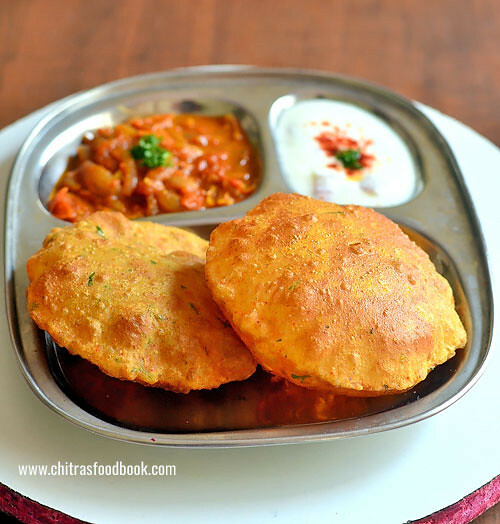 Side dish is not required for this puri recipe. Still I served it with tomato sabji and onion raita. Mixed veg kurma also goes well I guess.We loved it a lot. Its a winner recipe in my house. Do try this potato poori recipe for your kids and family. They will love it very much . Next I am planning to make methi poori and mint poori. Friends, If you know any other interesting poori varieties, do share them in the comments section. I will make it As I say in all my poori posts, thickness of poori while rolling and the proper temperature(heat) of oil is the secret to get nicely puffed up poori. I have shared those points below in detail. If you are a beginner, It will sure come by practice. 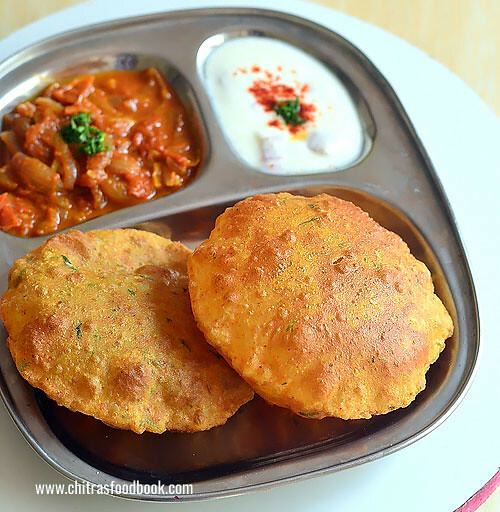 Ok, Lets see how to make Aloo Poori recipe with step by step photos and a video ! Wash and pressure cook potato in required water in very low flame for 2 whistles.Open the cooker and remove the potato. Peel the skin. Place the potato in a wide plate or bowl and mash it. To the mashed potato, add turmeric powder, red chilli powder, dhania powder, cumin seeds, garam masala powder, salt, finely chopped coriander leaves, crushed kasoori methi, wheat flour and mix well without adding water. Add wheat flour and mix well without adding water. Now add water little by little and make a smooth, non-sticky dough. No need to rest the dough. Roll immediately. Grease your hands with oil. Take a portion of dough.Knead for a minute. Make balls roughly. Keep the remaining dough closed till use. Take one ball, roll it well and flatten it. Dust in wheat flour once and roll the poori slightly thick. Make sure corners are thick. Remember it should not be rolled too thin like roti. It won’t puff up. Roll all the poori and arrange in a plate without overlapping each other. Heat oil in a kadai and when it gets heated , put a pinch of dough. If it rises immediately to the top, oil temperature is right. It should not be smoky. Pat the excess flour in the poori and drop one in the oil. Let it rise to the top. When it comes to top, pat it gently with the ladle. It will puff up nicely. Flip it after the bubbles cease.Cook the other side too.Press with the ladle for uniform cooking. Drain in a tissue paper and serve hot with raita or any sabji. Do not make any side dish with potato. U can make tomato sabji or mixed veg kurma for this poori. Poori gets puffed up only if its rolled thick evenly and properly. Oil temperature should be perfect. If its rolled thin, it comes like a papad. If the oil temperature is less, poori absorbs lot of oil and it won’t puff up. At the same time, oil should not be smoking hot. Poori will become dark golden. So after you deep fry one poori, reduce the flame completely low. After dropping the next poori, increase the flame to high. By doing this way, heat of the oil can be maintained. If oil becomes smoky hot, switch off the stove for sometime. When the oil comes to right temperature, deep fry again. As I have added Kashmiri red chilli powder, color of my poori was red. If you like white colored poori, add finely chopped green chilli instead of red chilli powder. Do not rest the dough for long time. Poori may drink oil while frying.Try to make puri as soon as u make the dough. No side dish is required for this poori. If you want to make it , mixed veg kurma and tomato onion sabji would be some good options. 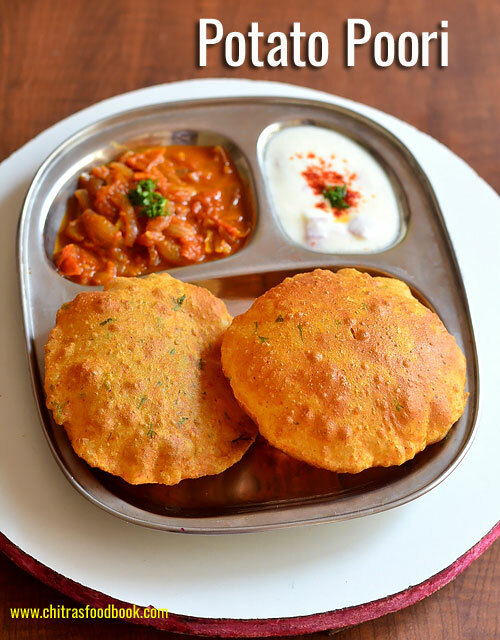 Enjoy this soft, masala flavored Potato Poori at home with raita and sabji ! Gobi Paratha is Sendhil’s most favorite Paratha recipe. After marriage he took me to In-swing restaurant in BDA complex, Banashankari and got this cauliflower paratha for me as he loves it very much. That’s the first time I tasted a stuffed paratha in my life. He told me to try the same at home. As I was a beginner in cooking, I did not have any idea about the stuffing part, how to roll paratha etc. When I tried it, all the stuffing came out while rolling and the paratha became a disaster. Still he appreciated me for my attempt and ate well. And that’s my man. Now after so many years of cooking, I can make a good gobi paratha for him. So I wanted to share this recipe in my blog with step by step photos and a detailed video recipe to help beginners. 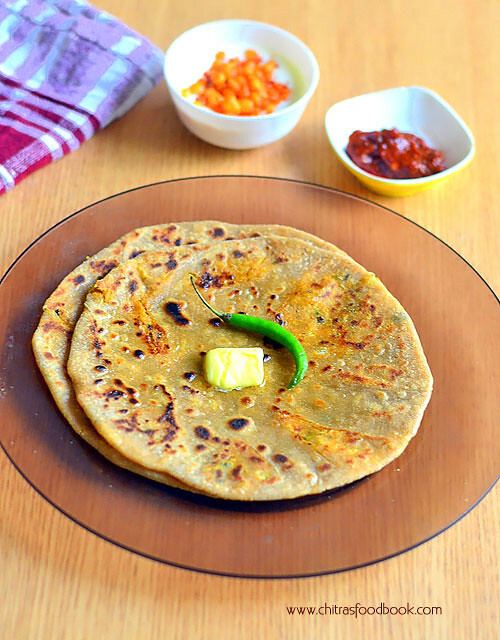 You can try this yummy paratha recipe for dinner or lunch box. Even Kids would love this paratha if you cook it adding ghee or butter. It comes out soft and stays good for hours. Lets see how to make Gobi paratha/Cauliflower paratha at home easily ! 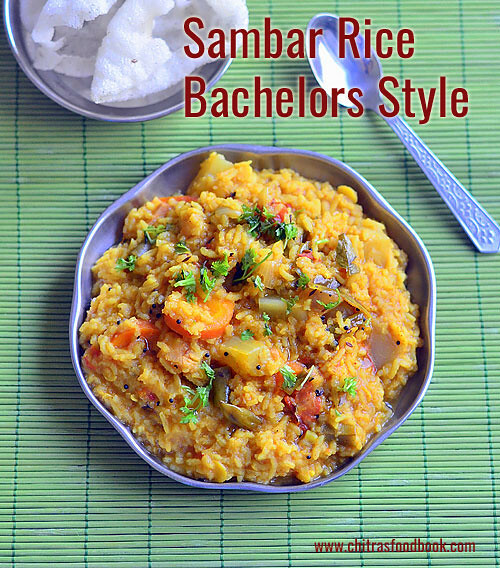 I am a big big fan of South Indian tomato rice (Thakkali sadam in Tamil). So I keep trying varieties of tomato rice recipes. Earlier I had posted my version of thakkali sadam in which the spicy tomato paste is mixed with cooked rice. 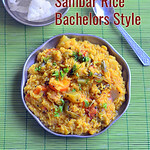 Then I shared my friend Shalini’s tomato rice recipe using electric rice cooker. 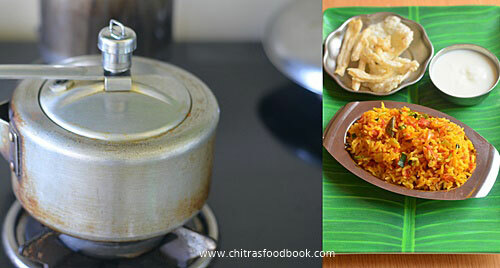 Today I have shared about how to make tomato rice directly in a pressure cooker. I learnt this recipe from my Thangam Athai ( My dad’s sister). 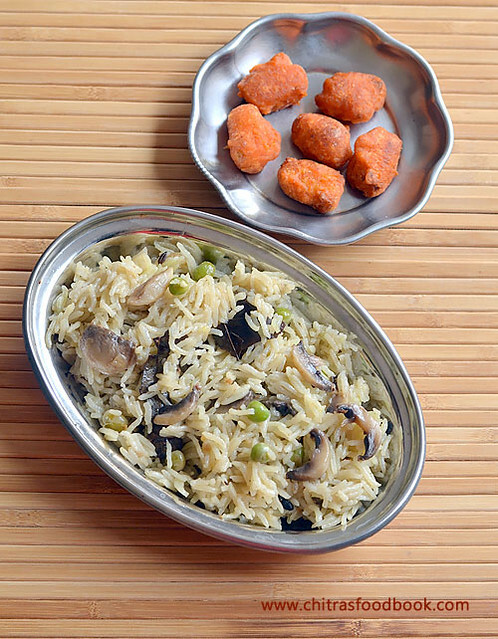 Its a very simple, quick and easy to make rice variety that is ideal for lunch box preparation. Bachelors and working women would love this recipe. 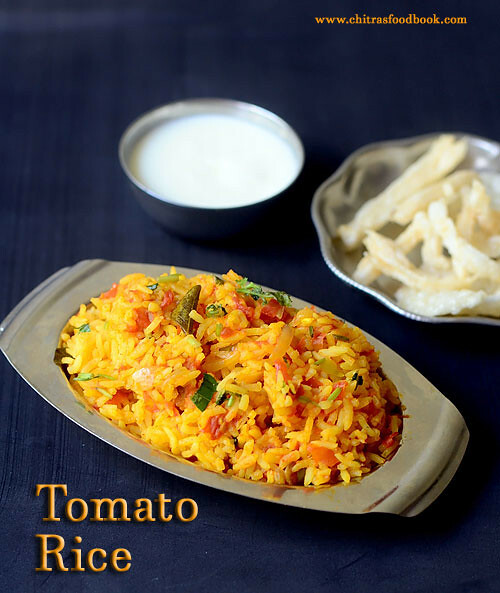 This tomato rice recipe is prepared with very less whole garam masala ingredients and had a slight spicy taste.So it has become our family favorite.I loved it very much and had the same for my lunch & dinner as well. 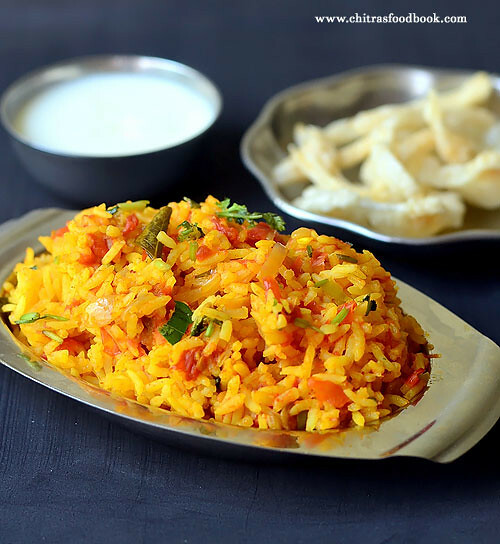 Simple onion raita and a papad or vadagam would be the best side dish for this tomato rice. 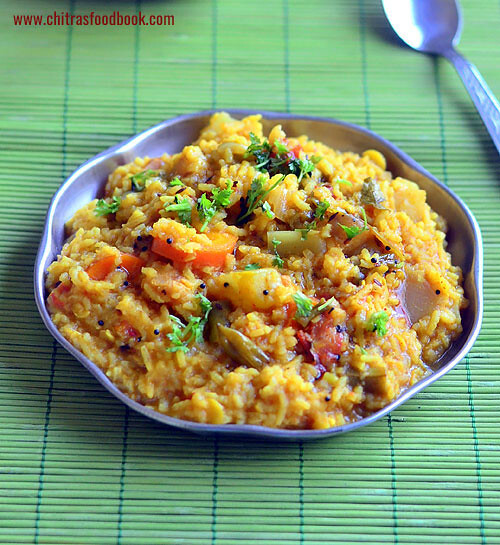 Friends, Do try this yummy South Indian style Tomato rice recipe for your lunch box. I am sure you will love its taste. Now lets see how to make Thakkali sadam using a pressure cooker easily with step by step photos . I have updated this recipe with a full video,Please check it ! 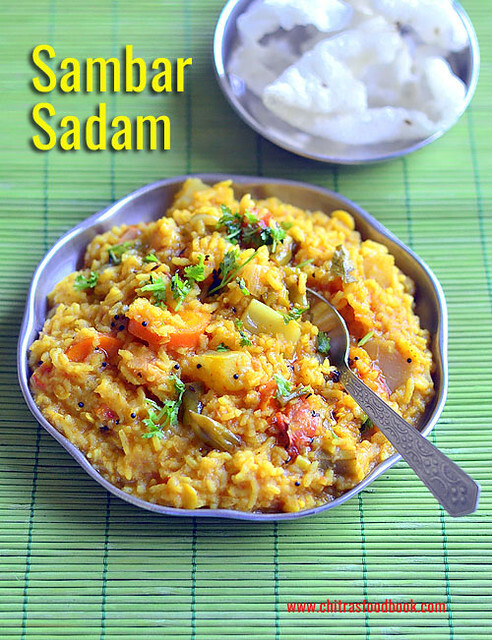 How to make tomato rice / thakkali sadam in a pressure cooker - Easy method ! Heat oil in a pressure cooker base, add cinnamon and cloves. Add finely chopped garlic cloves and saute for a second. Then add the chopped onion and sauté till transparent. Add finely chopped green chilli and curry leaves. Saute for few seconds. Add finely chopped tomato pieces and the required salt for rice. Saute until tomato turns pulpy and mushy. Add turmeric powder, red chilli powder and mix well for few seconds. Lastly add the soaked rice along with water. Mix well and check for taste.Add more salt & red chilli powder based on it.Pressure cook in very low flame for one whistle. It takes 8 to 10 minutes. Remove the lid after the steam is released. Mix the cooked rice with a fork. Garnish with finely chopped coriander leaves, mix well and serve hot with raita & papad. Add more chilli powder if you want spicy tomato rice. You can also add mint leaves along with curry leaves if you like the flavor of mint leaves. I have used steamed rice/ puzhungal arisi. You can use basmati rice or raw rice. 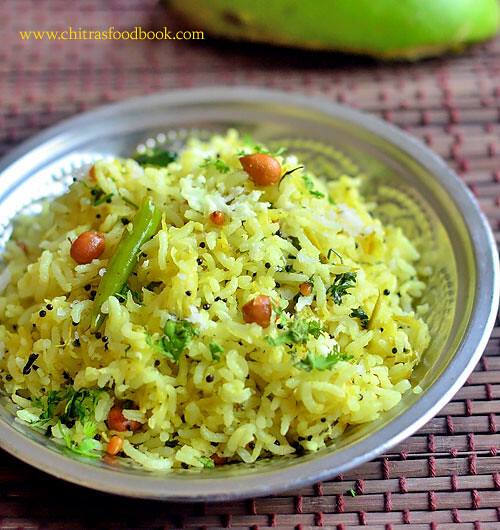 But soak the rice in water for minimum 30 minutes to get fluffy, soft and grainy rice. 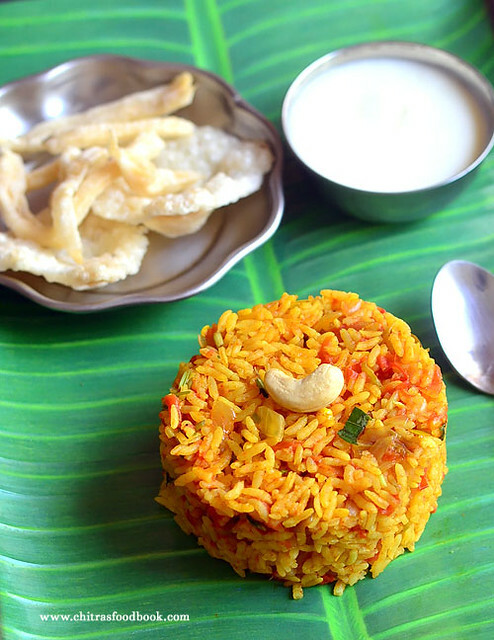 Enjoy this delicious South Indian style tomato rice recipe and have a quick lunch !